"Life isn't about waiting for the storm to pass. It is about learning to dance in the rain." While the above is a wonderful philosophy to embrace, equally wonderful is not having to worry about the storm or the rain and just embracing a warm sunny day - in Lisboa. 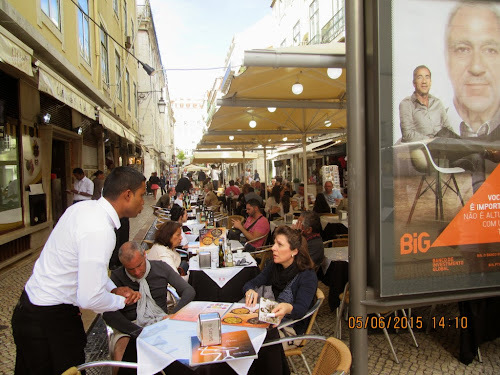 With only one full day in Lisbon, Dayton and I set out fairly early to explore and enjoy. 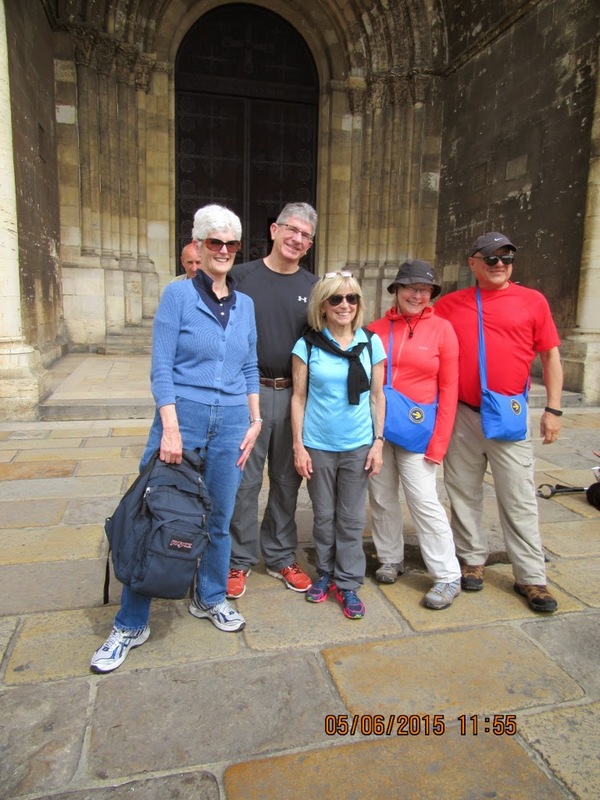 We headed straight to the Catedral Sé to get our first Camino Portuguese carimba (stamp) in our Pilgrim's Passport. From the cathedral we meandered through the warren of cobblestones streets to the ancient Castelo São Jorge. The line up to get in was enough to deter us so we bought a pint of fresh strawberries from the vendors outside the castle and continued on the walking tour that Dayton had found posted on the Pilgrim's Forum by Laurie (Peregrina 2000). The Metro took us higher up to the Rato area and we walked our way back down towards the old city stopping, as we tend to do, for late lunch at the restaurant suggested by Laurie. The restaurant Adega de São Rogue was a Portuguese dining gem. After being seated, a huge basket of rustic bread with butter, goat cheese and sardine pate was delivered. 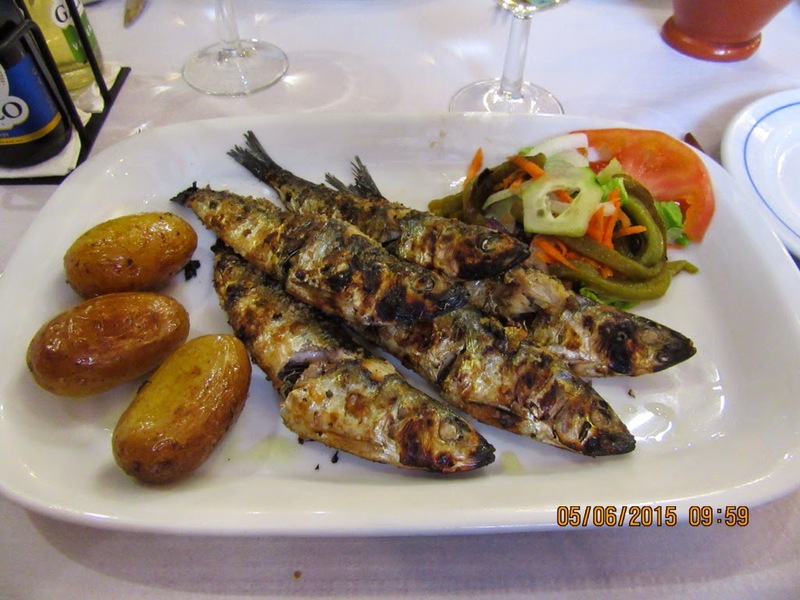 We might have misunderstood the interpretation of 'starters' on the menu as the two little 'starters' Dayton ordered, one of sardines and one of cod fritters each turned out to be a full entree. Undaunted Dayton rose to the culinary occasion. Portuguese sardines are a wee bit bigger than the canned ones Dayton is used to so, after the first choking bite, he realized it might be a good idea to take the bones out. For me rising to the culinary occasion was to enjoy the rustic bread, some shredded lettuce and wine. Word to the wise, if you are vegetarian in Portugal, you better not be gluten intolerant or a tea-totaller. After lunch we headed back to the cathedral to meet the lady who had prepared and posted this walking tour, Peregrina 2000 aka Laurie Reynolds from Illinois. 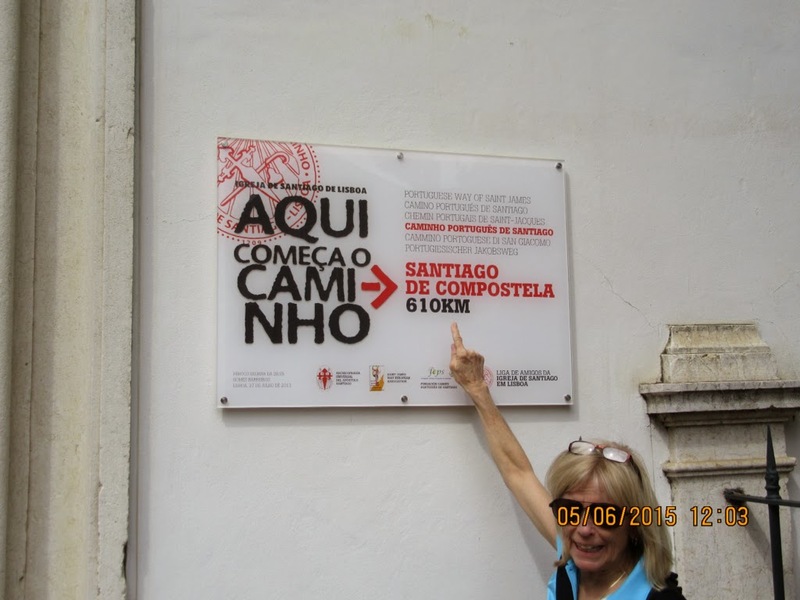 While I have spent the last few months spending most of my time teaching Yoga and Pilates classes, Dayton has been researching the Camino Portuguese and has made some really helpful contacts, Laurie being one of them. Laurie had used the Pilgrim's Forum to post an invite to any pilgrims who happened to be in Lisbon this day to meet at the cathedral at 3:30pm. We ended up meeting not only Laurie but also a couple from Mississauga who are also starting their Camino Portuguese tomorrow as well as two gentlemen from Lisbon. Aurelio, one of the Portuguese gentlemen, walked us up to the Igreja de Santiago, a little church recognizing the Camino Santiago. From there we settled down at an outdoor cafe for drinks and chatting. These are the Camino moments to savour and remember. Today has been such a great day that we just didn't want it to end so, after saying farewell to our new pilgrim friends, Dayton and I enjoyed a snack and drinks at another outdoor restaurant (I just love these cities where the climate is such that you can sit outdoors with a glass of vino and watch the world go by) before heading back to ready our backpacks for tomorrow and, by readying our packs, I mean putting as much stuff as possible into Dayton's pack and leaving mine as light as possible. I know. I have no shame. Continuing the 'no shame' and 'not letting this day end' theme, we are now back in our hotel lobby bar indulging in one last nightcap...or two. Let us just hope that the euphoria of this perfect day extends into the thirty seven plus kilometres we are intending to cover tomorrow. Our pilgrim route may vary but my pilgrim mantra has not....pay attention and don't whine. Tune in tomorrow to see if I live up to this. Looking forward to following your Camino - loved your others.